Android Embedded Archives - Inforce Computing, Inc. 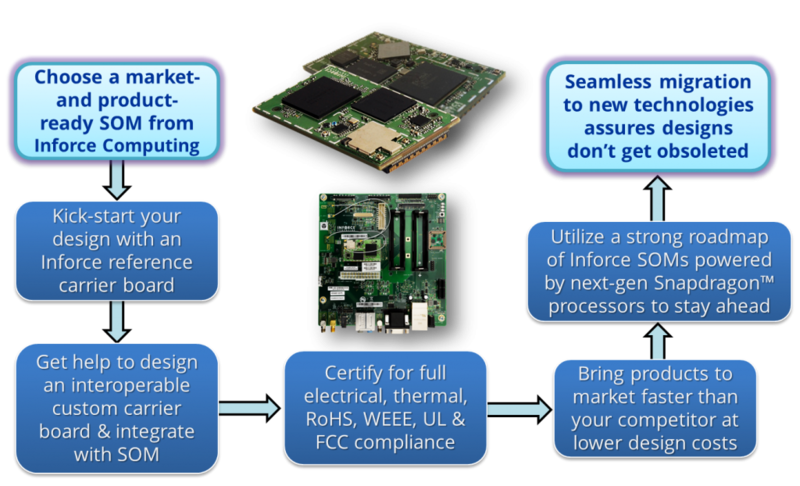 The cloud-optimized video endpoint is powered by an Inforce custom compute platform based on the Qualcomm Snapdragon 600 processor. Runs an Android OS and delivers HD 1080p30 video capture and playback (H.264 hardware assisted codec) as well as crystal clear audio over the network. LVDS-to-HDMI conversion enables simultaneous dual HD 1080p display outputs and HDMI-to-CSI conversion enables 1080p content sharing over the network via Wi-Fi or Gigabit Ethernet. Inforce’s custom product development services help pass stringent tests required for UL and FCC certifications and bring the production design to volume manufacturing.